Garlic Bread: On a scale of 1 to 10, this was a 5. 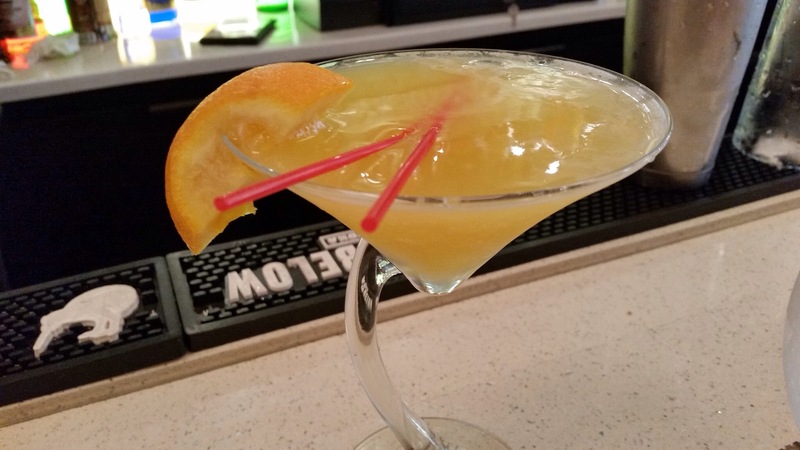 Mango Martini: Ketel One Vodka, mango liqueur, clear curacao, splash of lime juice. It’s an 8. 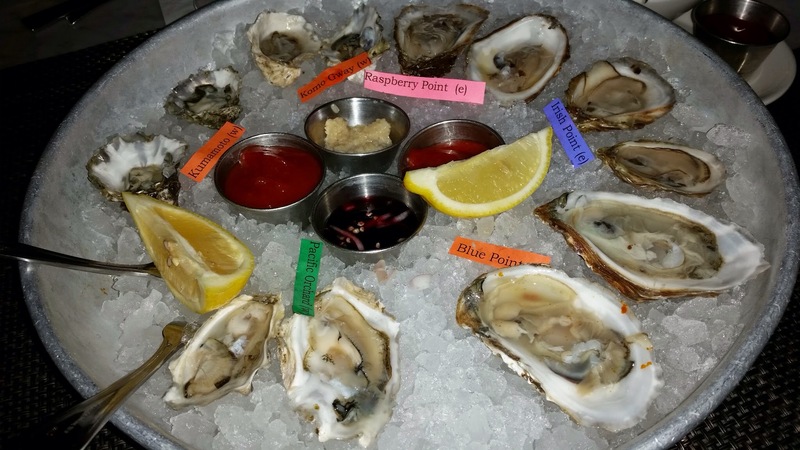 1/2 Dozen of Raw Blue Point Oysters and 1/2 Dozen of Raw Clams. This is heaven on ice. 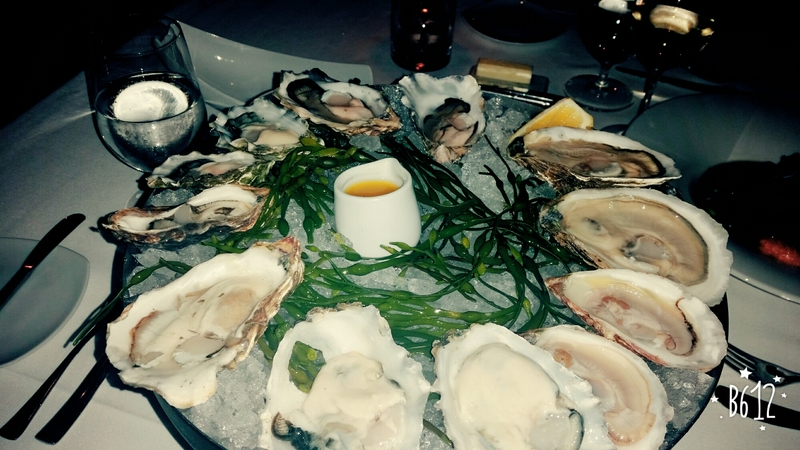 “Why Then World’s Mine Oyster,” William Shakespeare. Ten. Ten. Ten. The aftermath of the oysters and clams. Would like more, please! Grilled Octopus: This was a 10 for this preparation. 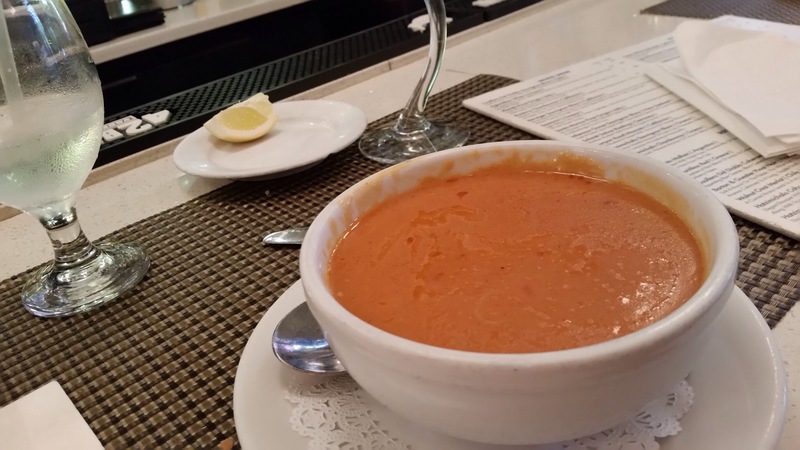 Shrimp Bisque: A 6. It needed spice. 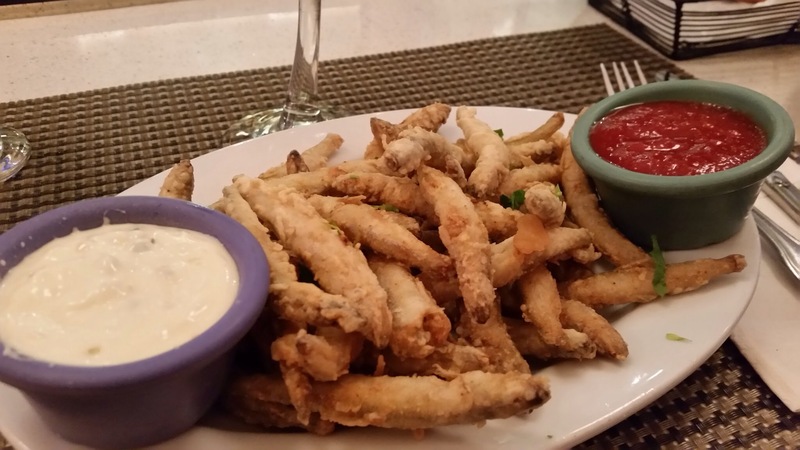 Smelts/Atherina (”Fish Fries”): Cute. But it’s only a 6. 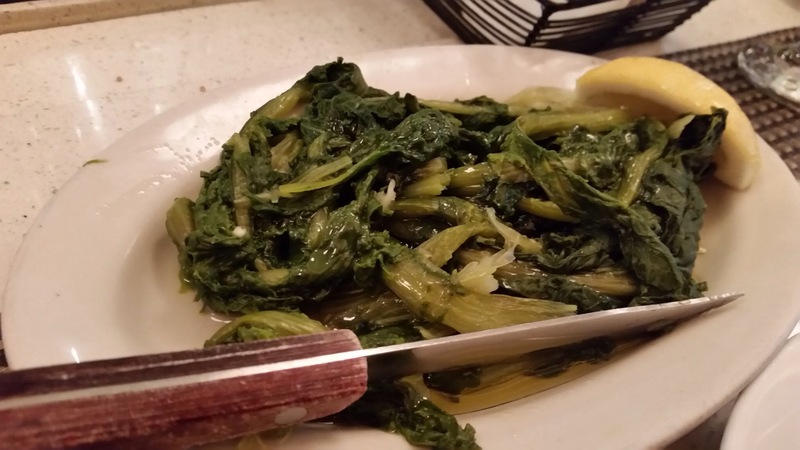 Horta: This is the Greek version of the greens, leafy and kale like. It’s a 7. 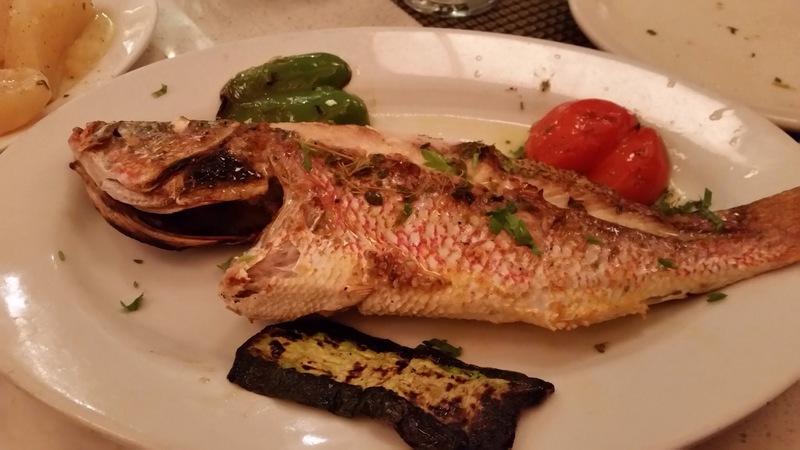 Red Snapper: Grilled and prepared with olive oil & fresh lemon juice. This market price was in the $20s for a 1.5 pound whole fish. It was tasteless. The fish was fresh – you cannot fault that. But why wouldn’t they put some salt on? Lemon Potatoes: starchy and palatable. A 7. Definitely recommend. The seafood is extremely fresh. You just have to figure out how to pick the right fish. 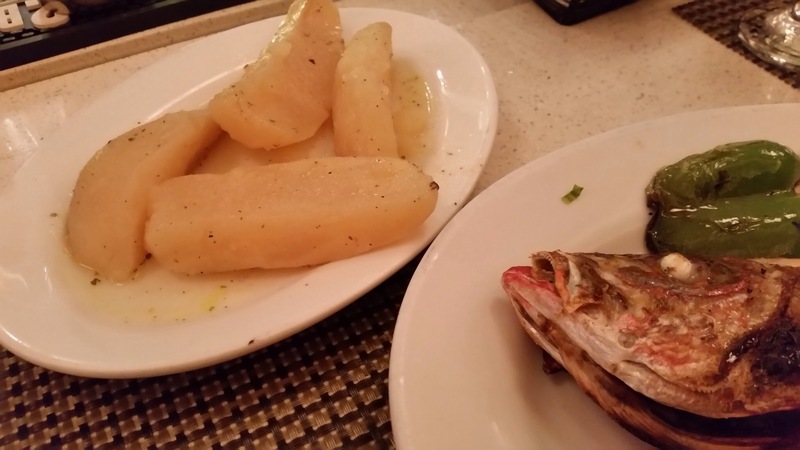 Should have gone with the Bronzino or the Porgy. 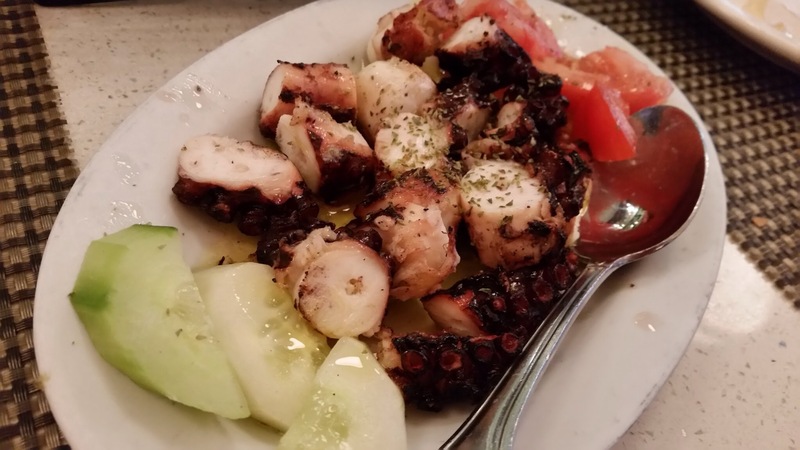 I was at the Reef Restaurant in Forest Hills, Queens NY once before and I ordered the Grilled Octopus (octopus leg chargrilled will olive oil and vinegar). It was tender; it was charred but not too charred; it tasted like success. I was very excited to return to try other items on the menu. I went for the seafood again since that’s what Reef is all about. 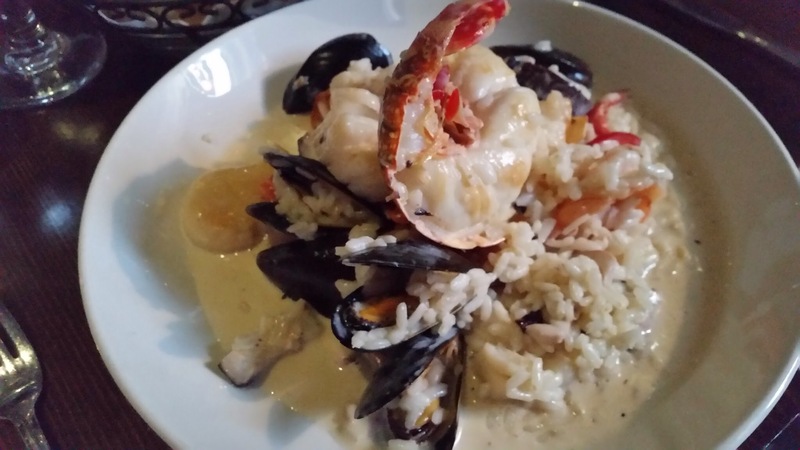 Special for the Day, Seafood Risotto: lobster, mussels, clams, squid, and octopus. 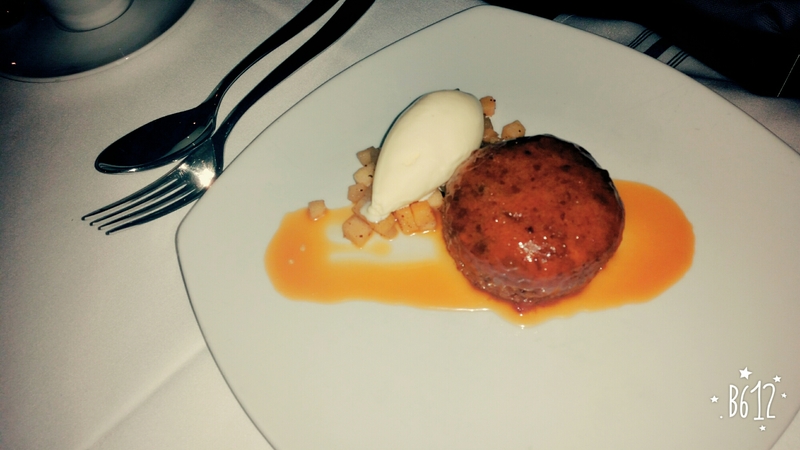 This item sounded so delicious when the waitress described it… but there was only one big problem. The mussels tasted funky: not bad, just not right. Fresh seafood should never smell and taste like seafood; it should be clean. But the mussels had an odor. The rest was fine and I did not have a tummy ache afterwards. Filet of Sole Stuffed with Crabmeat: My companion squeezed too much lemon onto the sole and completely killed the sole taste. What an idiot. But even so, the stuffed crabmeat was a bit of an overkill. 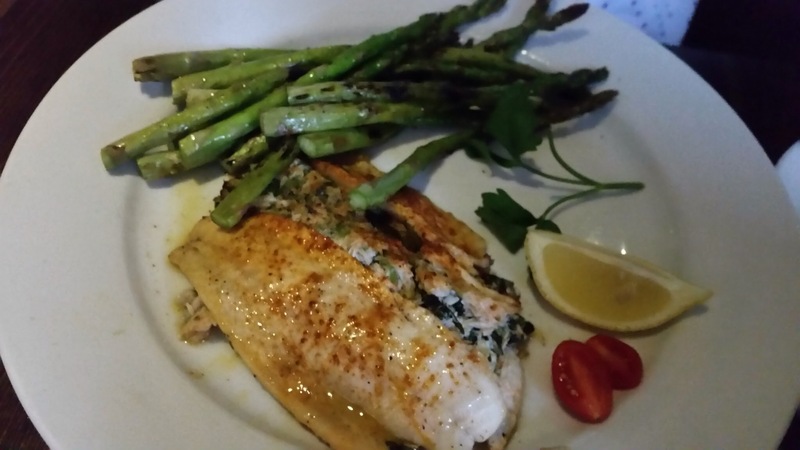 The asparagus was great, the best part of the meal. All it took was a few not perfectly right mussels to ruin a meal… the odor! Will not return. 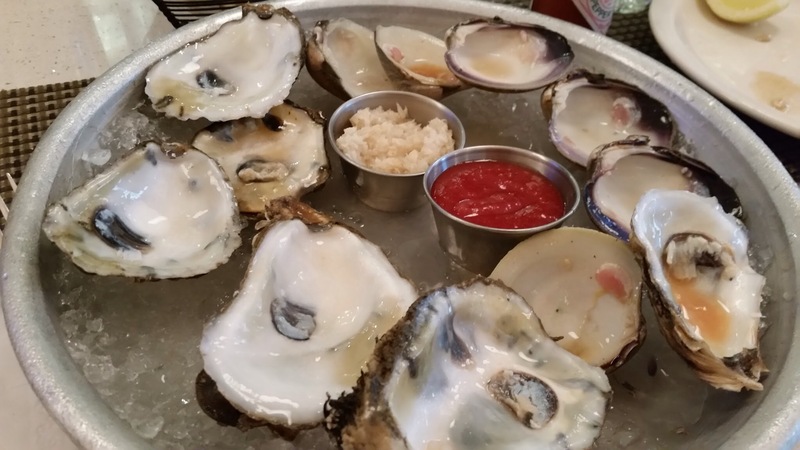 I have been to Ruby’s Oyster Bar & Bistro in Rye many times for breakfast before but have never written a post on it. Finally, I remembered and took some photos. Ruby’s Oyster Bar & Bistro is located on Purchase Street in Rye, or the center of the town. I was introduced to the place by a friend a couple of years ago and we have been going there for breakfast once in a while. Ruby’s is known for its Oysters (hence the name) but I have not had the privilege to try the oysters there. Today, we stayed with the well-known burger and salad. Grilled Bistro Burger with Blue Cheese and Rosemary Brown Sauce. My friend and I shared the entrées. Ruby’s was so accommodating and made two mini portions of the burger and the salad for us. Very accommodating. They get an A+ for customer service. The burger was well done, per my friend’s request; unfortunately, that made the meat dry. But it was still enjoyable enough. Grilled Salmon Cobb Salad. This was a nice change for the palate from the burger. Standard fare. Fresh and grilled well. But nothing to jump up and down for. I will need to go back for the oysters and see if it lives up to the name sake. Otherwise, Ruby’s is a nice place to have casual or business lunch but the memory of the food faded rather quickly in my mind. 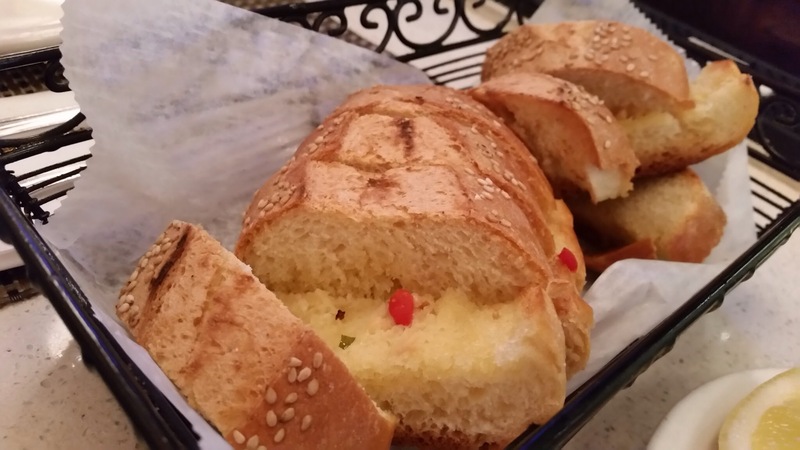 Don’t get me wrong – the food was decent to above average and the customer service is A plus. But the conversation I had with my friend was a lot more exciting than our entrées. Maybe it’s an ordering error on our side. 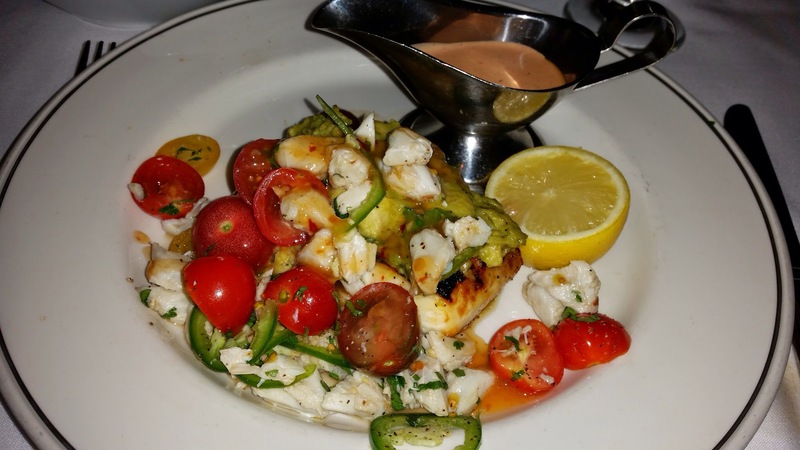 Truluck’s Seafood, Steak, Crab House in Boca Raton, Florida – Amazing Ingredients! 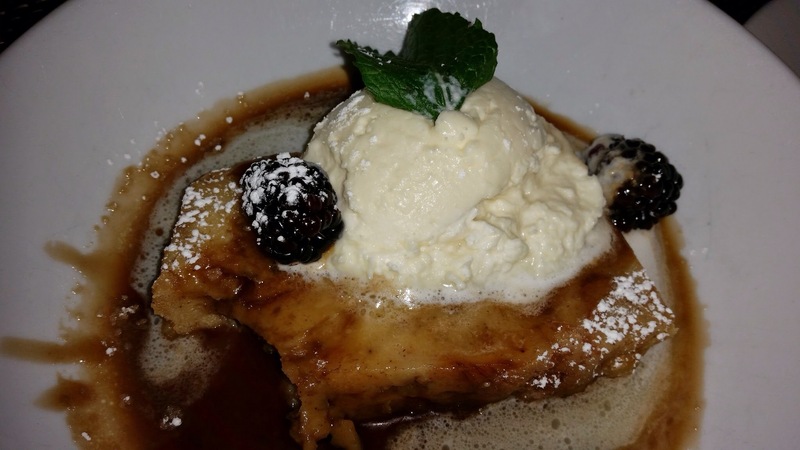 I was in Boca Raton, Florida for some business meetings and had the pleasure of eating dinner at Truluck’s with my work friends. The seafood was amazing. 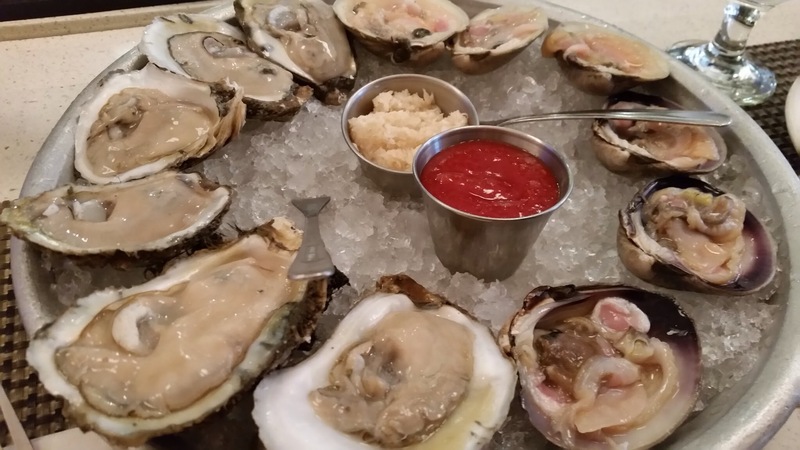 Truluck’s is primarily a seafood restaurant that offers fresh and seasonal seafood from their own fisheries. When I was there in mid February, Florida’s Stone Crabs were in season. The restaurant was elegant and open-aired. For a New Yorker, February in Florida is a dream come true. Incredible seafood in a beautiful restaurant, the warm air temp completed a perfect night. But I will say that being away from all the snowstorms and my daily life was such a nice change of pace. 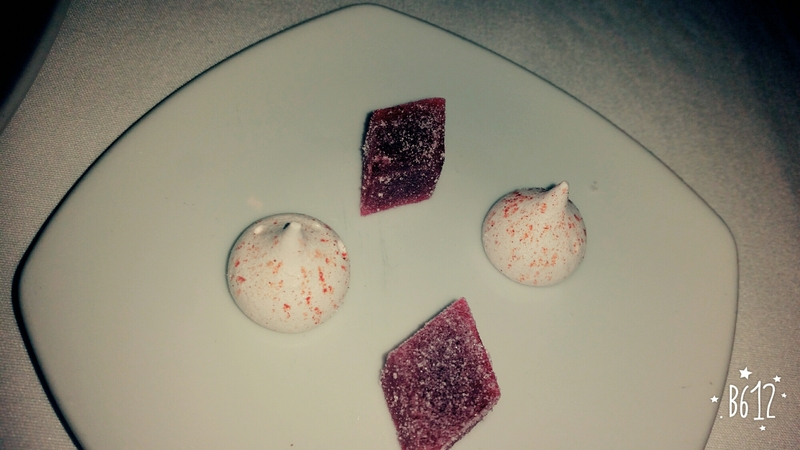 That sensation of the sweet escape probably skewed my taste buds. 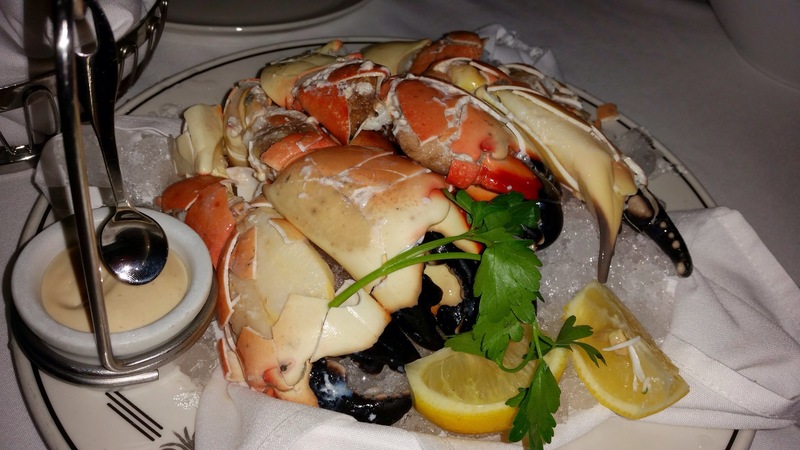 Fresh Florida Stone Crab Claws: Served chilled and pre-cracked with a specialty mustard sauce. These crab claws were the best claws I have had in a very long time. They were completely clean with no funny smells. The meat was tender with crab juices. Once you put it in your mouth, it slowly melted. This was my first experience with the Florida Stone Crabs. I was very impressed. 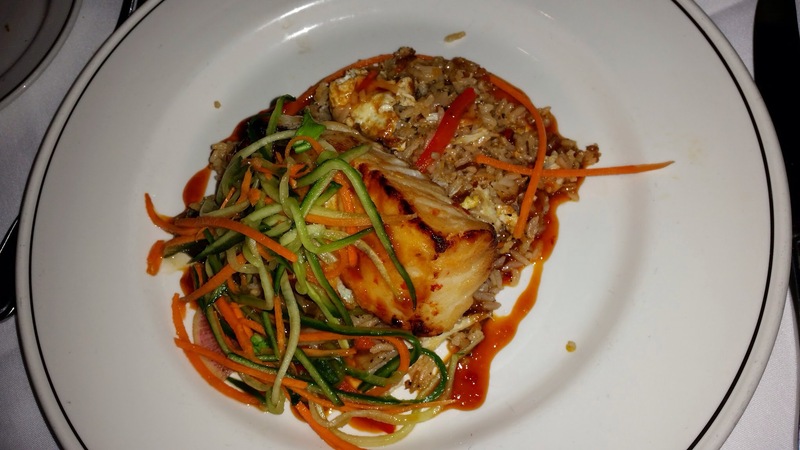 Miso-Glazed Seabass: MSC certified South Georgia Chilean seabass served with crab fried rice and chilled cucumber slaw. Kayla, my strategist and an excellent fisherwoman (you should seen the fish she caught), went back and forth on her consideration between this and the Cioppino (Fresh fish, shrimp, mussels, calamari, and crab simmered in a tomato and herb broth). I was so looking forward to trying the Cioppino… Or bouillabaisse in French. 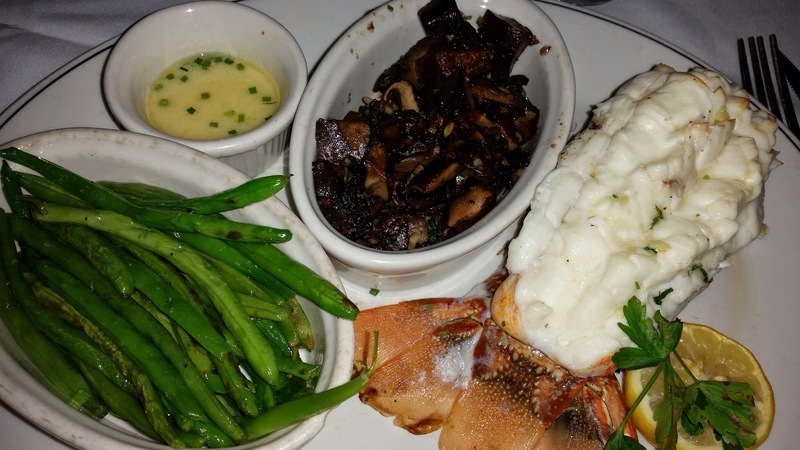 South African Lobster Tail: The Rolls-Royce of lobster with Balsamic-Glazed Portabellos and Sautéed Green Beans. This was unholy. The tail was so big and meaty. And so good. This was the first time I felt I had gotten a lot more than what I deserved. 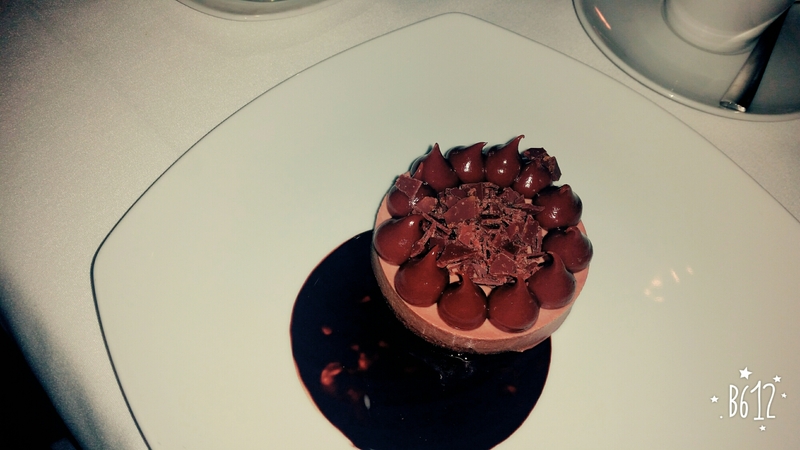 Felt rather spoiled. I am not a wasteful person and hate to not finish my plate. I left the portabello mushrooms which by themselves were a meal. I also left the green beans. In comparison, my “little” friend, Danielle, did well with her lobster tail; she shared and thoroughly enjoyed the bounty of the sea. 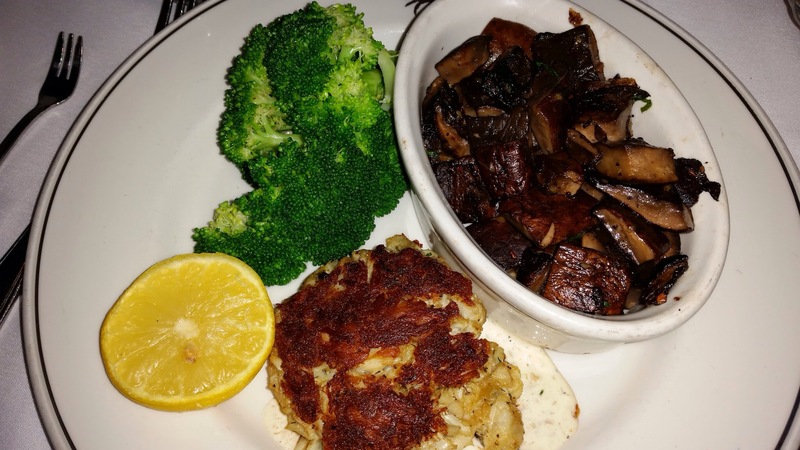 Sautéed Jumbo Lump Crab Cake: With house made tartar sauce, parmesan mashed potatoes and steamed broccoli. Thanks to Kristin (the thin runner who I aspire to run like and look like in the near future), I was able to taste this dish. In full disclosure, this is a dinner with my work friends who help me create marketing content and strategy. They all know that I write this blog so I got a piece of every dish they ordered! 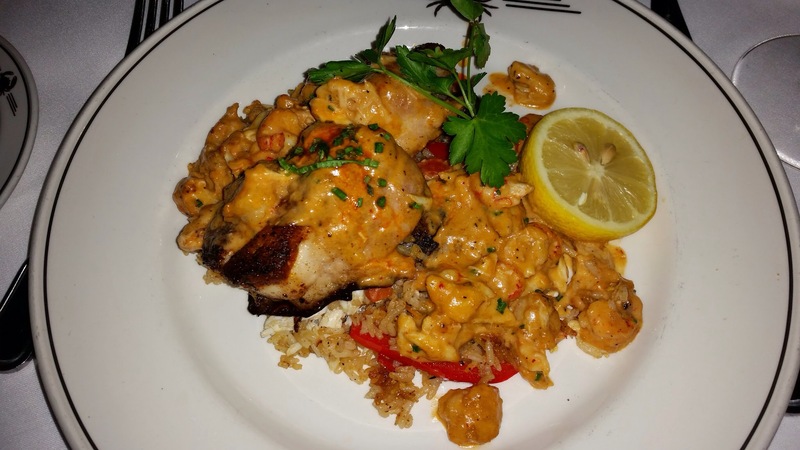 Blackened Grouper Pontchartrain: smothered with crawfish tails, shrimp, and blue crab in a spicy piquant Creole sauce. Did not taste this one but my social media colleague (Wally!) loved it. I am sure by now he had tweeted, posted to FB, Google+, LinkedIn, Instagram, and Pinterest. Vine is coming up in our repertoire shortly, with highly engaging video content! We will make seemingly dry and boring products come alive with creativity and imagination. Digital marketing at its best. Sweet and Spicy Icelandic Cod: True cod broiled and served with blue crab guacamole, tomato, jalapeños, and sweet chili sauce. Thanks to Matt (our SEO guru), I regretted my decision to order the South African lobster tail. 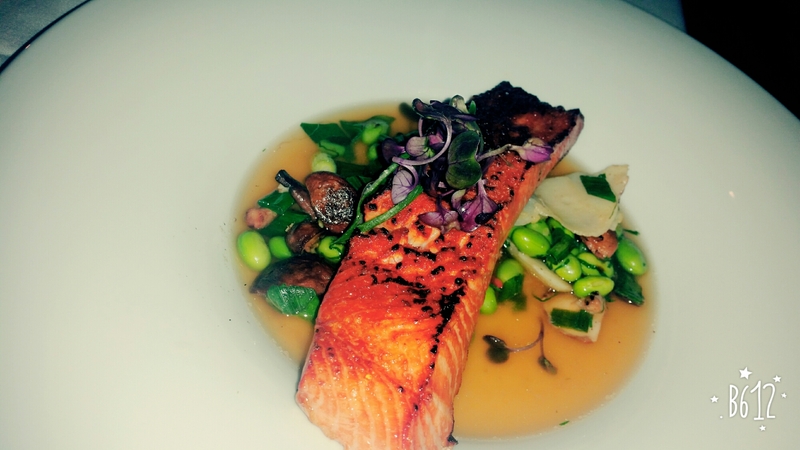 This dish is like a beautiful and intelligent woman in an evening gown. Not only is she pleasing to the eye, she is also interestingly opinionated and a superb conversationist. If the South African lobster tail is the Rolls-Royce, this is the futuristic spacecraft. It’s more refined. The taste is layered and complex. The cod, unlike what one may expect, is soft and delicate. Loved the kick from the jalapeños and the sweet chili sauce. 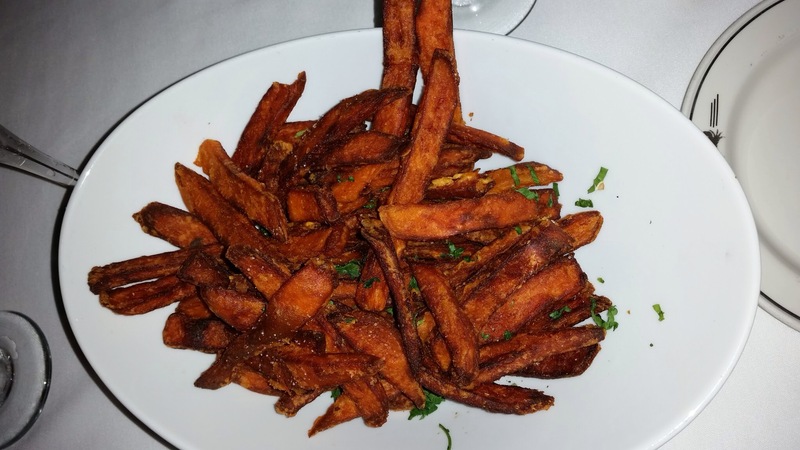 Sweet Potato Fries: everyone was making a big fuss about how good these are. 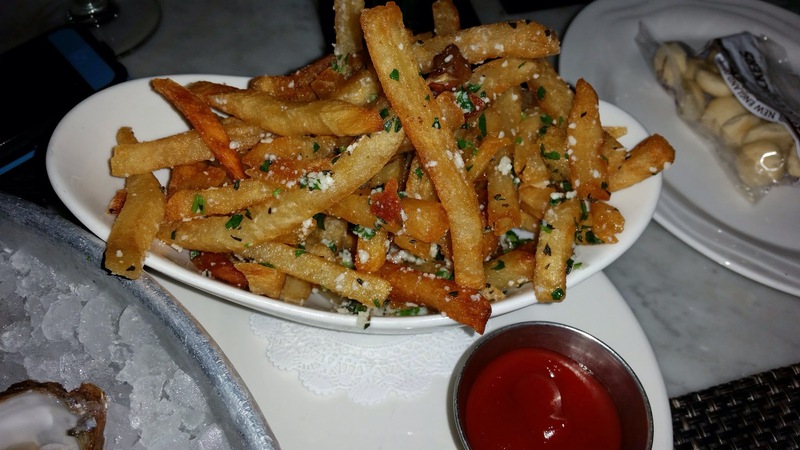 They are good but they are just fries. 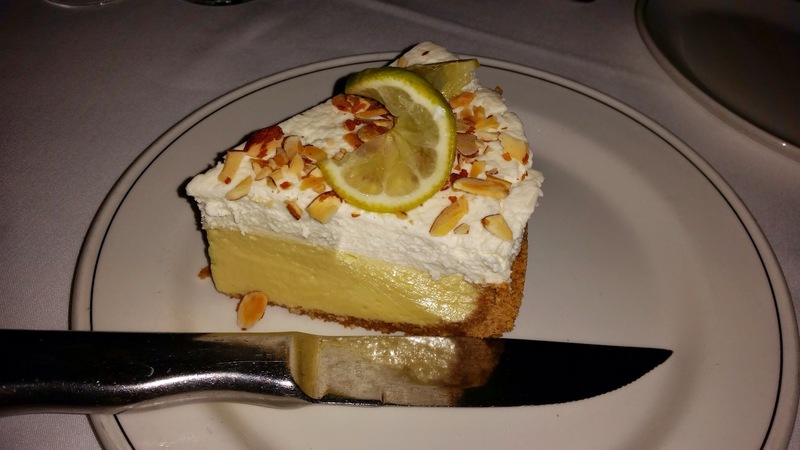 Key Lime Pie: Same comments as the sweet potato fries. For the record, Wally disagrees. He had once attempted to bring home multiple Florida key lime pies in his carried-on luggage for the family. He was forced to check his pies! Even all mushed up, he said they were still delicious. He is a die-hard key lime fan. 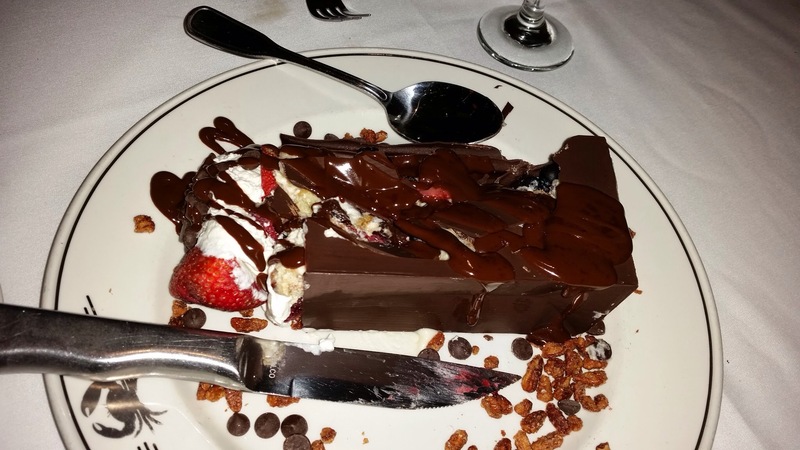 Chocolate Bag: This is sinful. This is a bag made out of chocolate and stuffed with all sort of savory sweet things such as cookies, raisins, truffles, M&Ms etc.. This was a highly memorable event. 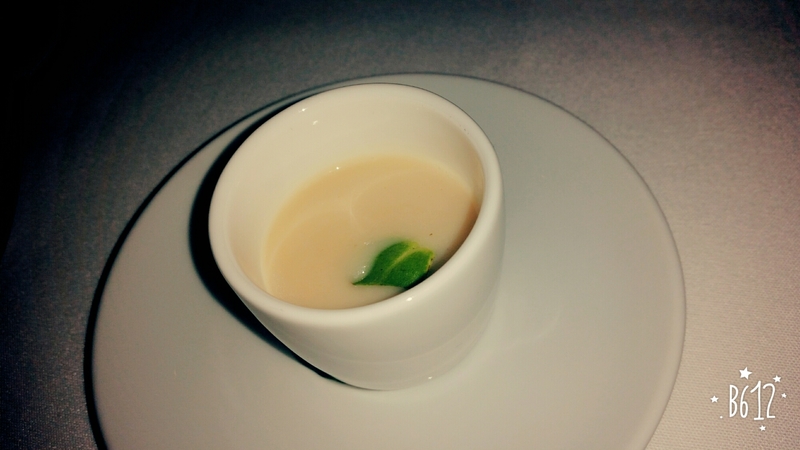 Food was amazing. Seafood was one of the best I have had in years. The price sticker was also shocking. Birthday and anniversary dinners, anyone? In Boca Raton at Mizner Park. Posted on March 8, 2015 March 8, 2015 Categories American, Florida, My Travels, SeafoodTags boca raton, FL restaurant, Florida stone crabs, Seafood restaurant boca raton, South African lobster tail, Truck's Seafood Restaurant, Truluck's, Truluck's boca ratonLeave a comment on Truluck’s Seafood, Steak, Crab House in Boca Raton, Florida – Amazing Ingredients!